Wet testing has begun on the new seafloor diamond drill rig that Nautilus Minerals Inc (TSX: NUS; OTC: NUSMF) will utilise on future exploration programmes. Chief executive Mike Johnston said: “According to our recently released preliminary economic assessment for Solwara-1, a single quarter's production at steady state mining rates (3,200 tonnes/day) and at average Solwara deposit grades, adds around $US110 million in EBITDA. The Solwara-1 seafloor massive sulphides project in the Bismarck Sea of Papua New Guinea has high grade minerals, including copper, gold and zinc. The PNG Government is a minor partner in this project. Johnston said the scope of the testing the Hobbit rig is to check its operational functionality of the control systems, landing capability, hydraulic functions, video survey systems, and drilling cycle time/performance, in a submerged environment. Testing will also look at the system’s ability to sustain simulated offshore operations at optimal productivity levels while familiarising personnel with all aspects of the equipment and operations, in a reduced cost environment. The Nautilus-developed rig, nick-named the “Hobbit” scout rig, has so far successfully met design targets in a series of land-based trials, largely focused on rod handling, functional drilling, and landing stability tests. This wet test program will occur over a two week period, and will expand testing parameters to include submerged operations and mechanical endurance. 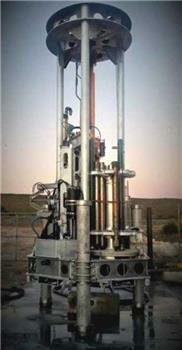 The rig design utilises Nautilus’ seafloor drilling experience to produce a rig that has improved landing and drill cycle capabilities, combined with simplified control systems, umbilical, and launch and recovery requirements that will allow deployment from cheaper vessels resulting in significant reductions to drilling costs. Nautilus will later look to deploy the rig on its South Pacific tenements. The Nautilus designed Hobbit drill rig.